So I had a dream last night that the new owners of Wrigley Field decided to remove the famous scoreboard from centerfield. Everyone was very upset. I was outside the park trying to take a picture of the scoreboardless stadium. I had the perfect shot lined up. There was a great sunset in the background. Just as I was about to take the picture, the bus that I was standing atop of suddenly drove off. It was quite upsetting. Did you know that not all Major League games are represented on the score board? There’s only room for 12 games. That dates back to when there were only 24 teams in Major League Baseball. I’ve always wondered if you could jump on a wireless internet network if you brought a laptop and had seats right next to the press box in the upper deck. It’s highly unlikely, but I wouldn’t be surprised if it worked. 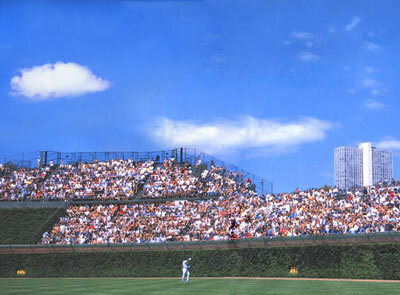 I kinda like Wrigley Field without the scoreboard too. Part of me thinks that people would be less upset about the scoreboard being taken down or replaced than other “improvements” currently looming. Oh man. What happened to the Wrigly Field scoreboard? Are they repairing it?